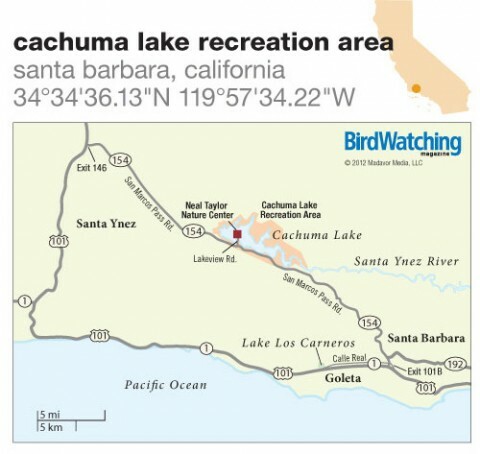 Only 20 minutes from downtown Santa Barbara and nestled in the Los Padres National Forrest, Cachuma Lake Recreation Area is a backcountry birding bonanza. It offers the opportunity to bird along sage-covered shores, aboard a naturalist-led boat excursion, or from the seat of a kayak or canoe. 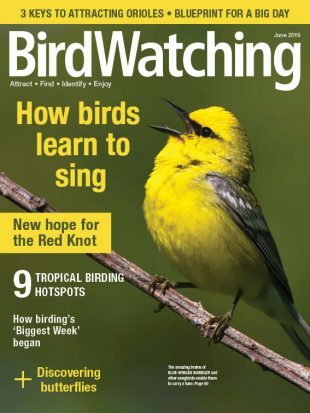 All three activities can be accomplished in a single day, thus maximizing the birding potential. Cachuma Lake was created in 1955 when the Santa Ynez River was dammed. It took three years for the seven-mile-long lake to fill in and reach its present size. The San Rafael Wilderness borders to the east and the Santa Ynez Mountains range to the west. Chuck Graham is a writer and photographer who writes often about birds in California. He also wrote about Carpinteria Salt Marsh, Carpinteria, Hotspot Near You No. 116, Soda Lake, Bakersfield, No. 123, Oso Flaco Lake Natural Area, Guadalupe, No. 138, Elkhorn Slough, Moss Landing, No. 154, and Hearst San Simeon State Park, Cambria, No. 185. Cachuma Lake Recreation Area protects a large lake, woodlands, and other habitats. From Santa Barbara, take Rt. 1/Hwy. 101 to exit 101B. Merge onto Calle Real and drive 0.5 miles. Turn right onto Rt. 154/San Marcos Pass Rd., drive 17.5 miles, and turn right on Lakeview Dr. From southbound Hwy. 101, take exit 146 onto Rt. 154/San Marcos Pass Rd. Drive 14 miles and turn left on Lakeview Dr.
Mountains, chaparral, oak savanna and woodland, lake, creeks, and river. Mostly flat. Wheelchair-accessible along maintained paths and trails around campgrounds on the west side of lake and on boat cruises. 180 species. Bald and Golden Eagles, Red-shouldered and Red-tailed Hawks, Northern Harrier, Turkey Vulture, Osprey, Western Screech- and Spotted Owls, Western and Clark’s Grebes, Double-crested Cormorant, Western Bluebird, Yellow-billed Magpie, Acorn Woodpecker, Red-breasted Sapsucker, Western Scrub-Jay, Belted Kingfisher, Cliff Swallow, Anna’s and Costa’s Hummingbirds, Oak Titmouse, Varied Thrush, Wrentit, Red-winged Blackbird, Western Wood-Pewee, Cassin’s and Hutton’s Vireos, Band-tailed Pigeon, Cedar Waxwing, California Towhee, Mountain Quail, Dark-eyed Junco, Northern Shoveler, Common Loon. Nature center has exhibits, gifts, maps, and restrooms. Campsites and yurts available for rent. Two-hour nature cruises on Fridays, Saturdays, and Sundays. Cruise fees $15 for adults, $7 for children ages 4-12. Reservations recommended; call (805) 686-5050 weekdays, or (805) 686-5055 on Fridays after 3 p.m. and on weekends. County park. Open year-round. January through July, 6 a.m. to 8:30 p.m.; August through December, 7 a.m. to 5 p.m. Admission $10 per vehicle for day use. Bring a spotting scope. If you paddle a kayak or canoe, bring a dry bag or use a Pelican Case to keep camera gear and optics dry. Neal Taylor Nature Center, (805) 693-0691. About 30 miles west of Cachuma Lake on Figueroa Mountain Rd. Cassin’s Finch, Olive-sided Flycatcher, Ruby-crowned Kinglet, Clark’s Nutcracker, Pine Siskin, Red Crossbill, MacGillivray’s Warbler. 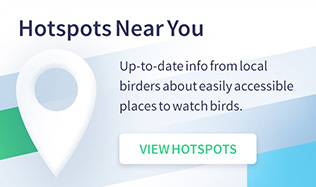 Hotspot Near You No. 70. Located about 20 miles south of Cachuma Lake on Los Carneros Rd. White-tailed Kite, Great-tailed Grackle, California Thrasher, Spotted Towhee.